What’s a Portable App you say? I though you would never ask! 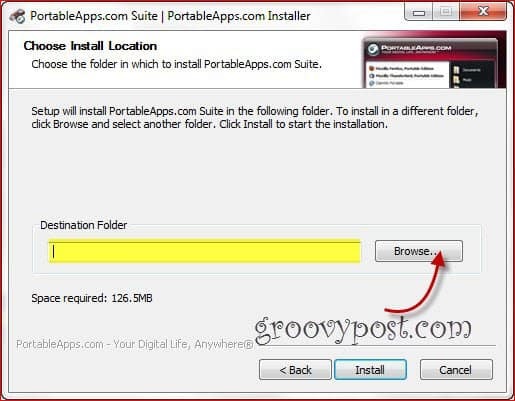 Portable Apps is a suite of apps that can be run off a USB flash drive, without the need to install them; get them here). For me, I love Portable Apps! They are exactly what I need being that I’m always on the move jumping between several computers daily. It allows me to have all the apps I need with me at all times (including a Firefox with all the bookmarks, synced right up to my last browsing session). In the past I always kept my Portable Apps installed on a flash drive I would carry with me however I always seemed to misplace them or leave them at home by mistake, and as luck would have it, this normally happened when I needed them the most. So this brings me around to a groovy new way I’ve been using Portable apps for several months which work on all my systems. First of all, you’ll need a Dropbox account and (obviously), the Dropbox software installed on all the computers you’ll be using. If you need to know more about Dropbox, check out this very comprehensive groovyPost. let’s get on with it :) . 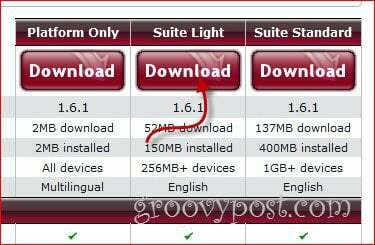 Launch the portable apps installer and chose Suite Light, as I won’t be needing the OpenOffice.org suite, but feel free to use that one (provided you have enough free space on your Dropbox). Now, select the folder in your Dropbox where you want Portable Apps installed. 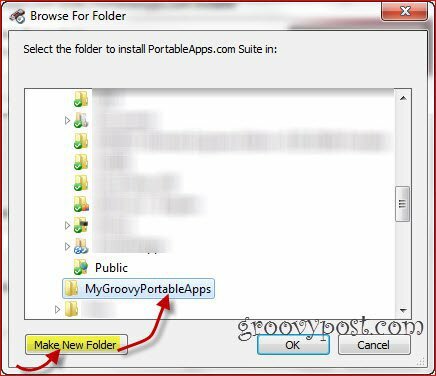 It could be the main “My Dropbox” folder, or you could create a subfolder, just to keep things in perfect order… I’ve created My Dropbox/MyGroovyPortableApps in my screenshot below. Click OK to save the install location and Install to kick things off. All done, you should be all set at this point. Feel free to jump into your Dropbox folder you performed the install and all your apps should be sitting there ready for you to launch. The only other thing you need to remember is to save any documents you work on inside your Dropbox folders so they will sync to your other systems. Enjoy your new untethered App access! Does this also work if you have the web version available, like me at the office? Im not allowed to install Dropbox at the office. Umm…. Well I guess it should work if you can browse to dropbox.com and pull up your dropbox folder. From there you should be able to download the apps locally then save them locally but upload them (your files) back up to dropbox over the browser. So kinda ya…. In your case I would probably just stick with a USB drive and the Portable Apps to keep things simple and easier to use. Thank you for the idea. I thought of using it, but after some thoughts about privacy I would rather consider not using it. For the moment I am using FreeFileSync (https://sourceforge.net/projects/freefilesync/) to sync all my data with my Android phone and my external Hard Disk and my Flash Disk. I am quite satisfied with this method for now. Thanks for the tip and the link. I’m reading it over but I’m not 100% sure how it works? It doesn’t look like an online file sync. It looks like it will only sync your devices if you connect them together correct? Also, regarding Dropbox – Are you concerned about privacy in regards to keeping your data in the cloud and the Dropbox folks peaking at your data or is it something else? Right, it is not an online file sync. It syncs devices when directly connected. My privacy concerns are about leaving my data into the cloud below the eyes of DropBox folks. Does this work with iOS devices? I hadn’t thought about mobile apps on an iPad/iPhone before. I Have two ‘dropbox’es, at home and at work. When I run a portable app (for example utorrent portable) it writes it’s data to a local file (resume.dat), but because it’s under dropbox – it’s immediatlly sync’ed to the other computer – this happens alot – so my dropbox is always busy sending small files. When the same app is used on both computers on the same time I get conflicts. Is there a way to avoid this endless syncing of “workdir” files? I haven’t seen any method to restrict syncing of individual files, but through “selective sync” (see preferences->Advanced->Selective sync-> Advanced view) you can tell dropbox not to sync individual folders. *IF* you never need to sync these “workdir” files or any other files in the same folders as the workdir files, this ought to solve the issue. Patrick, that’s a brilliant idea, actually. Thanks. You just have to remember to dismount the TrueCrypt drive on the current computer, when you leave it. Because DropBox can’t sync the container file to the cloud while it’s used as a drive. 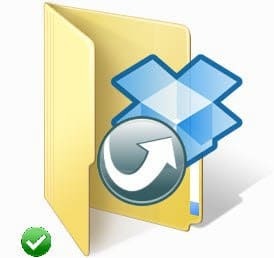 Has anyone heard of or tried secretsync which can encrept a Dropbox folder for added security. I use this with my portableapps folder in Dropbox and it works great!!! trying out Rohos USB Encryption as a way to protect my flash drive should I lose it. Has anyone found something that’s easy to use?